One of the most essential parts of web development is finding the right look-and-feel for what you’re building. 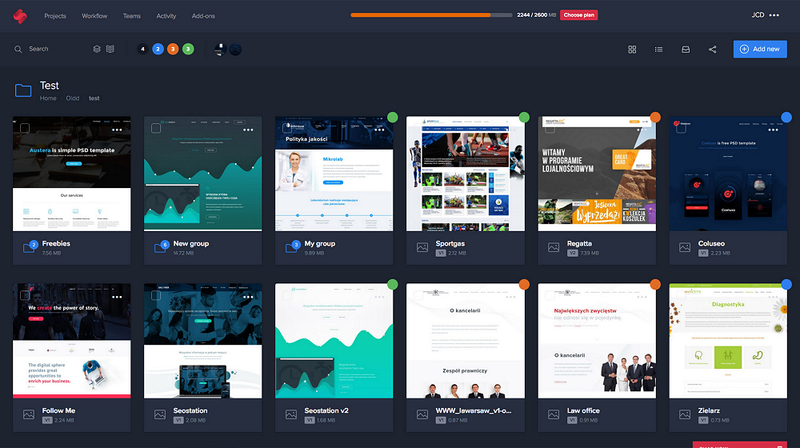 When working on a project, web designers experiment with tons of themes, customizations, animations, and other aspects to find exactly what they or their clients like. And CSS plays a major role in such web designing. Typically, web designing with CSS involves putting in the code, watching how it turns out on the website, tweaking the code a bit, then again watching the results, and so on. It’s an iterative process involving considerable time and effort. And for someone who’s new to CSS, the whole thing can turn into a nightmare since he’d have to research to find the exact lines of code that can result in the effect he want. Although it’s a part of the job, it is natural for designers to feel exhausted and frankly, annoyed with it after some time. But that’s just how the process goes. There isn’t really anything anyone can do about it right? Well, not actually! With Animista, a lot can be done to ease CSS based web designing; actually to the point of making it click-based. Want to know how? 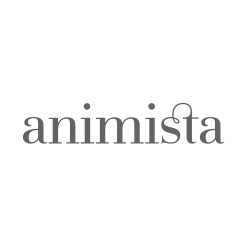 Animista – the wonder tool for creating and testing CSS on the fly! Animista is a place where you can play with a collection of pre-made CSS animations, tweak them and save only the ones you actually wish to use. It’s like a supermarket for CSS animations. You visit, you tweak and play around, you consider options, and you pick the stuff you like. The online tool contains a considerable amount of animations that have been organized in a meaningful and accessible way so that they can be easily reused on different projects. 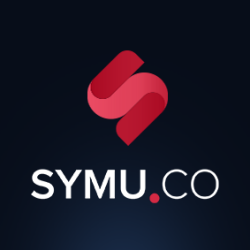 What started off as a small personal project for a web designer, has shaped into this online playground which contains a collection of pre-made animations that can be tested with various options like easing, delay, duration and others. Once a user is satisfied with his selections, all he needs to do is save the code for the animation and he’s done. The work which would have taken hours to research, build, and test, squeezed into the work of minutes – that’s Animista for you! The tool’s homepage is a bit confusing to be honest, but you can view that as a sign of uniqueness too. When you visit the page, all you can see in the name of the tool and a ‘Try Me’ button next to it. That’s it! No scroll-bars, no menus, no footers, nothing. For a moment you start wondering if the page has loaded properly or are some elements still pending. Once you’ve figured out that you need to click on ‘Try Me’ to proceed, you’ll land up on the tool’s dashboard. And everything will instantly become clear. When you see something you like just hit the ‘heart’ icon on the upper-right corner of the animation panel. Once you do this, several options will become available on the top-right corner of the screen. Rinse and repeat until you are happy with your picks. You can see your favorites at any time by hitting the “Funnel” button or click the “Trash” button to start from scratch. When you are ready, head to download screen by clicking the ‘Download’ button or download link in main navigation. If you use Chrome browser, hit the download button and check your download folder. If everything went well the ‘animista.css’ file should be there. Alternatively, you can generate the code for the animation by clicking on the “curly braces” icon on the upper-right corner of the animation panel. When you see the code, simply copy it and paste it into your favorite code editor. Needless to say, a tool that offers such flexibility, variety of options, and ease-of-use and is also free is a clear cut winner. However, Animista does have a lot to improve on. This includes direct download support for browsers other than Chrome, more object options, and a brief explanation of what the different options on the left exactly do (it’s mostly try and find out for beginners right now). We like Animista, and so do a lot of designers across the globe. A few more enhancements and sometime later this tool could be one of the simplest-yet-most-useful tools out there. Posted November 21st, 2017 in Web Design. 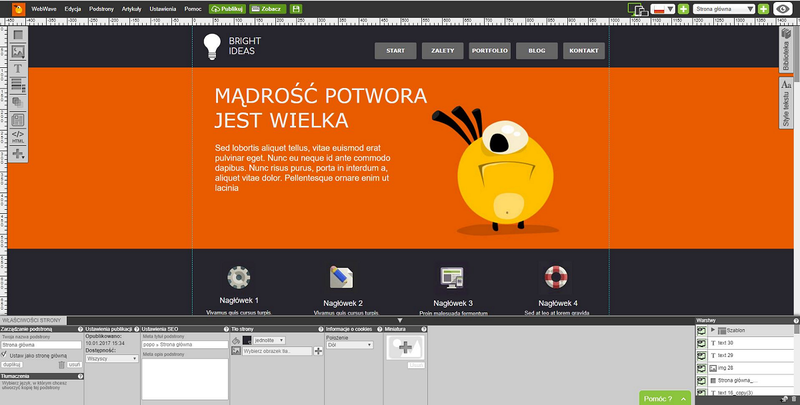 Tagged: animation, CSS, effects. Many artists today are taking the e-commerce road to market their talent. And that’s actually a great idea. Amazon, eBay and other popular online selling platforms play a pivotal role in making art reach the right customers. But what do you think attracts users most when monitoring art online. It’s true a low price is a crowd-puller, but to truly appeal the senses, an art-work needs to look absolutely stunning. The same logic applies to clothes, accessories, home décor, and pretty much everything that’s available for sale online. Something that’s low priced will never sell if its depiction or image on an e-commerce website isn’t attractive. However, an item that looks ravishing tends to sell despite a slightly steep price. Bottom line – to sell something online, its depiction / image / photograph should be perfect. We know where you’re going – Photoshop? Nah, here’s something simpler and more reasonable – ClippingMagic. ClippingMagic – give photos a makeover! ClippingMagic is an online tool that lets you accomplish all the editing tasks you need to publish great images. With a few clicks, it lets you remove image background, make them transparent, adjust colors, add / drop shadows, as well as crop the images to create an eye-popping result. 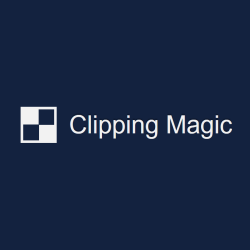 Of course it doesn’t have all the features of Photoshop but if editing photos to highlight your work / product online is what you’re looking for, ClippingMagic is the perfect choice. The tool’s intuitive algorithms make complex tasks like removing image background seem like child’s play. All you have to do is mark the foreground with a green line and the background with a red line and a click later, you’ll have a great transparent image that you can post on Amazon and eBay to sell. And all that for a fraction of the hassle and cost – neat! With ClippingMagic you can quickly create a catalog of neat results by conveniently clipping a number if images simultaneously. The above mentioned features are just the tip of the iceberg. To find out about the complete spectrum of the tool’s features, visit its homepage (https://clippingmagic.com/). To say that ClippingMagic doesn’t have a learning curve attached with it wouldn’t be wrong. 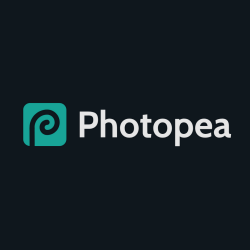 Depending upon how you wish to enhance your images, you can select which feature of the tool to use and view its dedicated tutorial on the website. Each tutorial includes a series of easy to understand steps and following them really isn’t difficult. To test how simple the tool actually is, we scrolled down the homepage to reach the link for Basics Tutorial. On clicking the link, we landed on a page where a sample image was edited to remove background. There was also an option to “Try Your Own Image”. We clicked on the button to experiment with the tool first-hand. The results were updated in the adjacent panel in real-time. We could see the affect of each mouse click and movement which was quite interesting. A convenient ‘undo’ button helped revert any changes we didn’t like in the result. There was a variety of other editing options available including color changes (saturation, temperature, brightness, etc. ), adding shadows, cropping, fine-tuning the edges, etc. Once all changes were done and we were satisfied, we tried downloading the image. That’s when we were required to sign-up. To download even a single edited image you’ll need to subscribe to one of the affordable plans. We actually found the tool to be quite useful. You can upload and edit any number of images in any way you like. But to save edited images to your system, you’ll need to subscribe. Fair enough! As far as cons are concerned, we found only a single one. While marking image foreground and background you’ll have to be really careful. The wrong kind of marking can cut off too much or too little of the image border or background or edge. The real-time preview window will help you out with this. Come to think of it, this isn’t a con, just a precaution you’ll have to follow while using the tool. 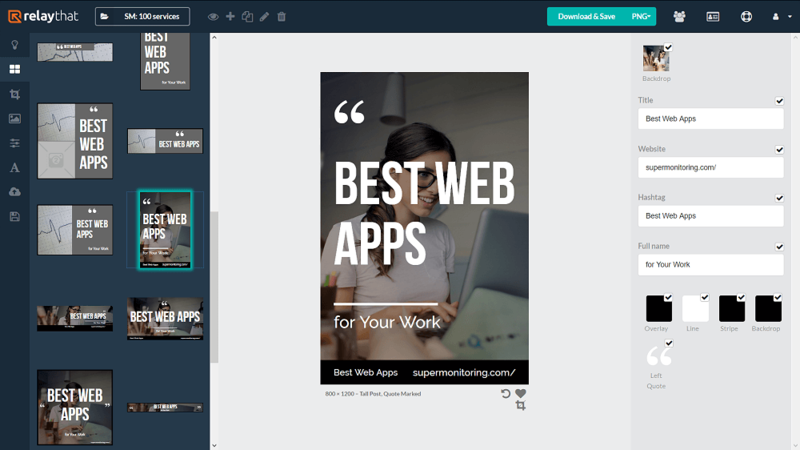 We loved the tool – less hassle, less investment and a number of great photo editing features. Thumbs-up to the creators! Posted March 22nd, 2017 in Web Design. 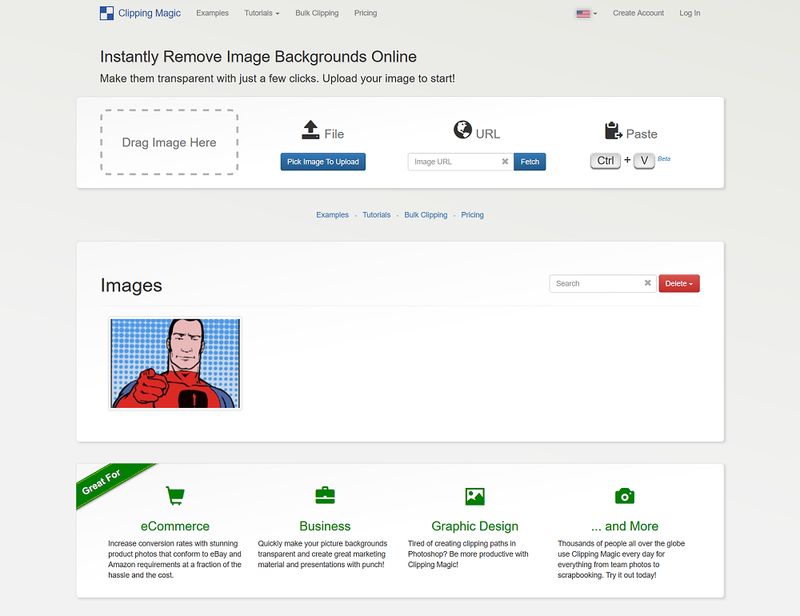 Tagged: images, photos, remove backround, transparent. The world around us is changing. Internet has made it possible for people from all walks of life to access information about any and everything. Today, it is possible for a housewife to create a fully-functional dynamic website using just her laptop, and all she would need is a set of the right tools and a few manuals. That’s the kind of power automation has brought to our doorsteps. Speaking of which, today there are a number of web toolkits or editors that allow non-technical people to do stuff that only professionals could do up until a few years ago. Take Twitter BootStrap for example. 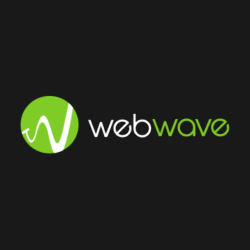 Everything one would need to create a good-looking working website is in there. Now imagine you’re a fashion designer with zero information on the way websites are made. You want to advertise yourself on the Internet but don’t know anyone who can build a nice website for you, or maybe you don’t have the money for it. 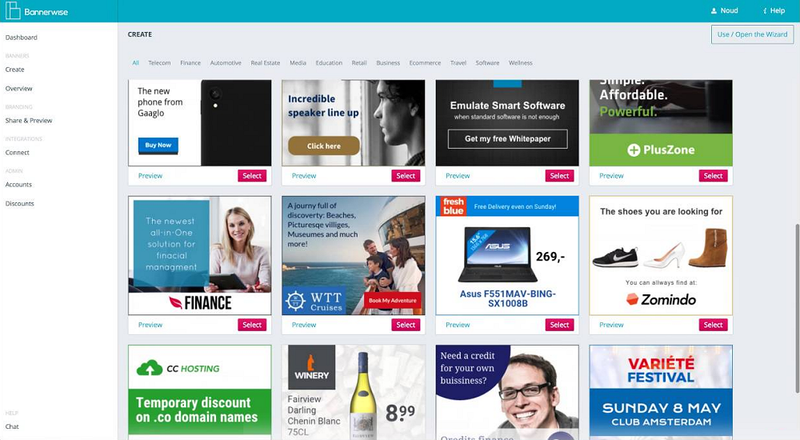 What you would need is something exactly like BootStrap that’ll let you create your custom website with everything you have in mind, with no prior knowledge of the subject, and with practically no investment. Sounds wonderful, doesn’t it? Well, we’re not going to elaborate on BootStrap any more but a similar tool that lets you customize the way images and icons look on your web-apps, websites, and mobile-apps, without the need to code or have any prior tech-knowledge. The tool we’re talking about is called Fontello, and we’re sure by the end of this review, you’ll fall in love with it. Fontello – the wonder Icon Font generator! Okay before you get confused about what Icon Fonts are, here’s a little intro. When we create documents on computers, laptops, or handheld devices, the way numbers and text are displayed is controlled by what is called the Font Family. Numerous fonts are included in a Font Family (for example, Arial, Verdana, Times New Roman) and there are ways to customize those using different styles like Bold, Italics, Underline, etc. Most people who’ve created Word documents would be familiar with fonts. Now, Icon Fonts are also fonts, but instead of containing letters or numbers, they contain symbols and glyphs. Consider Emoticons used in popular social media platforms and messaging apps for example. Smiley faces, cartoon faces, animal pictures, direction signs, and basically anything apart from text and numbers that can be used to depict some information can be categorized as icon fonts. Icon Fonts are a smarter choice over regular images since they don’t take as much time to load, scale better, and can be customized using CSS in a lot more ways. Now that we’ve cleared the pleasantries, let’s get to business. 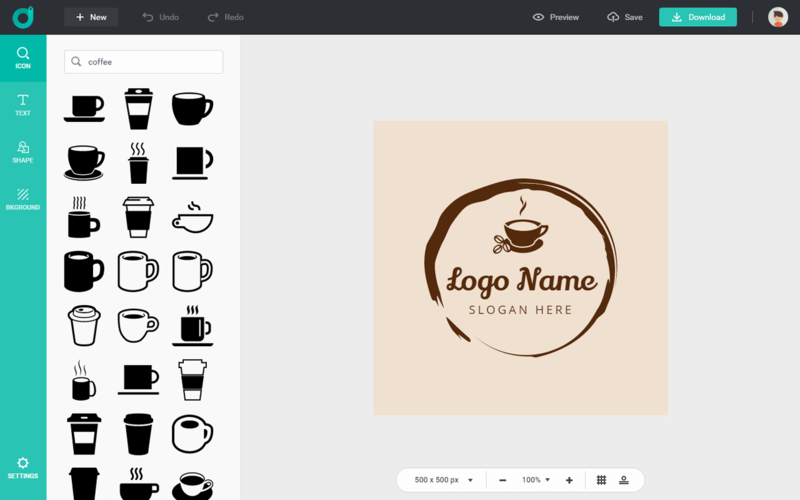 Fontello is an online tool that lets you create your own custom icon fonts by packing vector images into web-fonts. 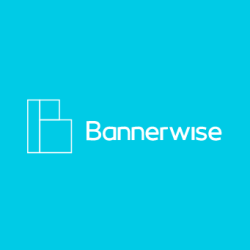 It provides you with everything that’s necessary to include graphics into your web pages without the need to actually code. Also, the tool has a huge built-in collection of open source icon fonts and art-works that you can scan, download, customize, and use for free. /they keep updating their databases so you can keep monitoring it for new fonts every now and then. Essentially, the tool transforms you into an icon font wizard who can generate personalized icons to match your website and work style, look, and feel. And all of that with no need to code, and absolutely no cost. 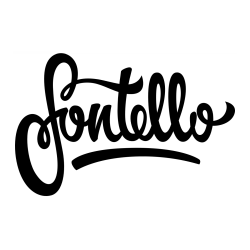 God Bless the creators of Fontello! Open Fontello.com and you’ll see a wide range of icon fonts displayed on the home page. Select any font by clicking on it and proceed with the customizations. Or, you could search for an icon font through a search box on the upper left corner. For our test runs we searched for the keyword “smiley”. The results showed us all icons that had names containing the word “smiley”. Next we selected one of the smiley icons and that activated many options on the interface. We could resize the icon using a convenient slider on the top, change the name of the font through the Customize Names tab, customize the code for the font through the Customize Codes tab, and then we could download the web-font. Apart from these options, we could import our own icon font files into Fontello, customize them using their tools and save them. However, we came to discover this feature was suitable only for professional icon font developers. There was an API we could use in our website too. You can also get in touch with the creators of specific icon fonts to know more about their creations and how you can customize them further. There are literally hundreds of icon fonts on Fontello that you can download and use in your projects. And that really is the beauty of the tool. Just go to it, take what you like, donate if you wish to, or contribute a font or two, access GIT code for the icons, create new icon fonts, and that’s it. No need to sign-up or pay anything or even mention your name / email. It’s a beautiful, open source, free world! We’re going to change the way we list down pros and cons for Fontello because there isn’t a clear distinction between the two in this tool’s case. Actually, the points we’re going to mentione aren’t really pluses or minuses; they’re just features of the tool. Fontello as an online tool isn’t beautiful, but then it isn’t meant to be. Instead, it is convenient and lets you get straight to the point. 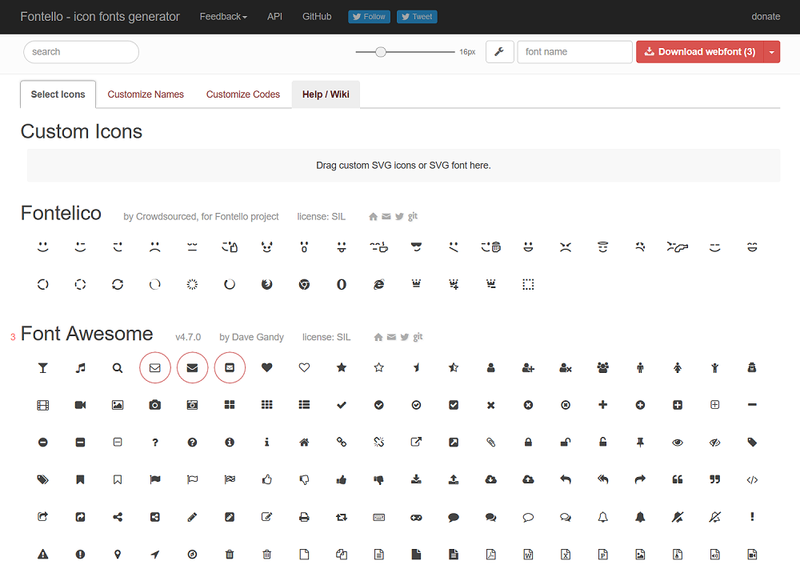 Fontello lets you search for icon fonts, customize them, and quickly preview results. It gives you a lot of control over iconic fonts through CSS. But the icons are single-colored. There are ways you can make them multi-color but they’re a bit complex for everyday users. Plus, human-interface guidelines suggest using single colored fonts. There is a slight learning curve involved. But then, a very small percentage of people actually need iconic fonts and if you’re among them, you’ll focus on the end results. Posted March 1st, 2017 in Web Design. Tagged: Font Awesome, fonts, glyphs, icons. Modern products and services are all about excelling in the field of customer satisfaction. The organizations that have user experience, popularly known as UX, as their primary objective are the ones that have the highest chances of success as compared to others. That’s the reason modern day UX designers are some of the highest paid professionals in the technology field. But when the costs go high, the road gets steep for small organizations. What they need is killer UX design skills at a price they can afford. 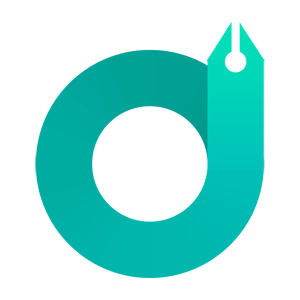 Enter – UXPin. UXPin is an online tool that lets you and your team work collectively on wire-framing, prototyping, user testing and more without the need of writing code. 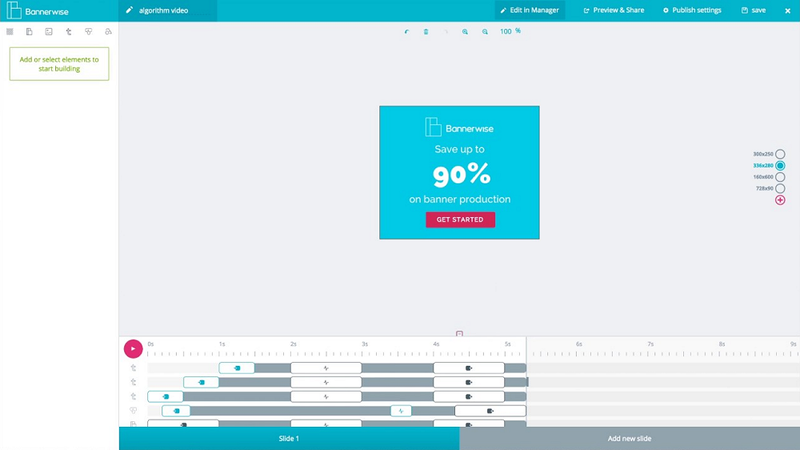 It lets you create user flows, static / interactive designs, prototypes with advanced states, and interactive wire-frames within minutes and share them with your team in different formats (PDF, PNG, HTML, etc). Other team-mates can monitor the designs shared with them, leave their feedback in the form of comments and notify the people the comments are meant for. You can even get manager approvals for your UX designs directly through the tool. 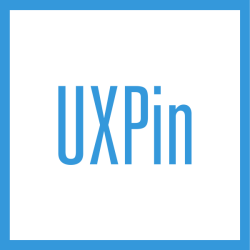 With its state-of-the-art features and easy working interface, UXPin is one tool that helps save teams hundreds of hours by simplifying product development and collaboration through elimination of coding. UXPin can play a pivotal role in bringing distributed UX design teams together through its platform. 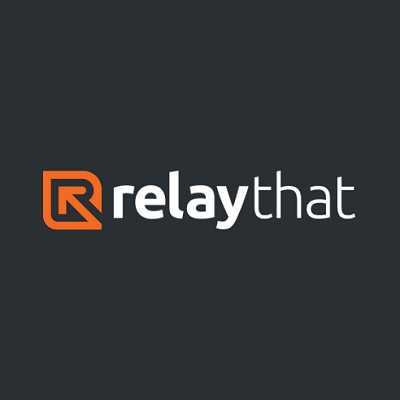 With this one tool, people sitting across different continents can work together in real-time. It lets teams quickly test their UX designs across platforms and allows people to actually go into a design and cut and paste components where needed. It is a tool that lets you go beyond the traditional limits of designing. You can jump right into the action by starting with UXPin’s free trial. It is simple to register. 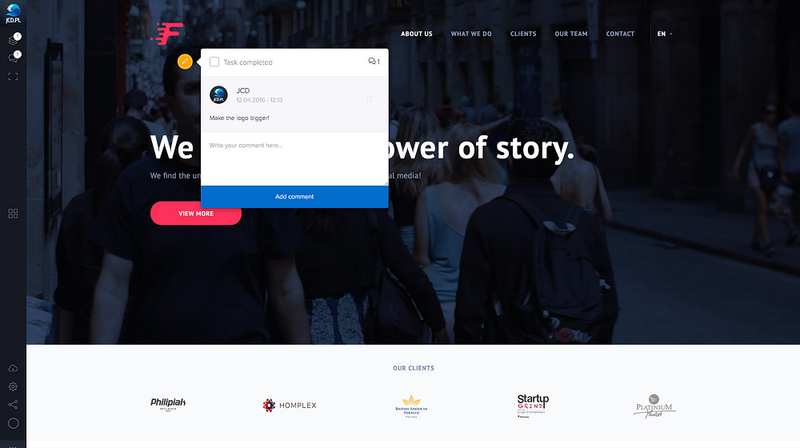 All you have to do is enter your company email address where required and hit on the big blue button that says “Start using it now!” on the tool’s homepage. You could also let the experts at UXPin give you and your team a helpful demo. For now, let’s stick to the free trial. Once you’ve entered your email id, the tool will ask you for a few more details before proceeding. It’s the usual process most tools follow to customize themselves to suit your needs better. Typically, the details you’d need to provide would include the size of your design team, information as to how you got to know about UXPin, and what role you play in your project. A short and sweet tour later, you will arrive at your dashboard. In the dashboard you’ll see a dummy project, options to add new members or manage your team, options to upgrade, and most importantly, the option to create a new project. We suggest to start with new project creation as that will give you the most exposure to UXPin’s features. Click on “Create new project” and give it a name. Save and proceed. The next screen will ask you to choose between using the UXPin editor to create designs from scratch or import them from Photoshop or Sketch. We chose to start from scratch and arrived at the handsome UXPin editor. The UXPin editor has a gray colored work area in the center of the screen with drag-and-droppable elements on the left. By default, the “Basic Elements” library is selected but you can change that through a convenient drop-down. 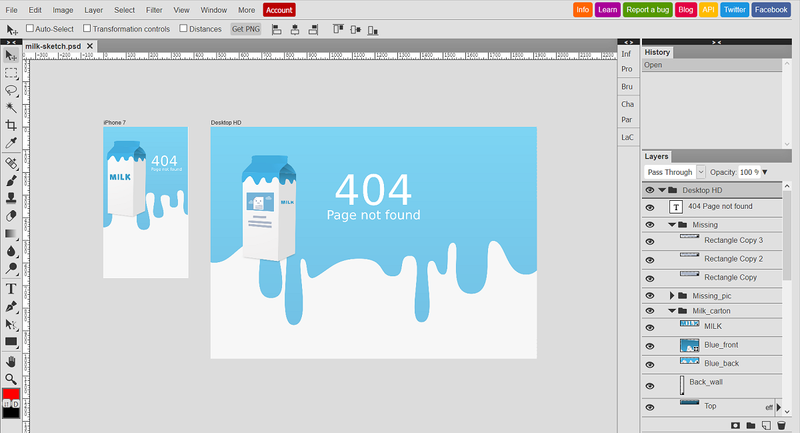 You can create pages and layers in your design and name it whatever you wish to. 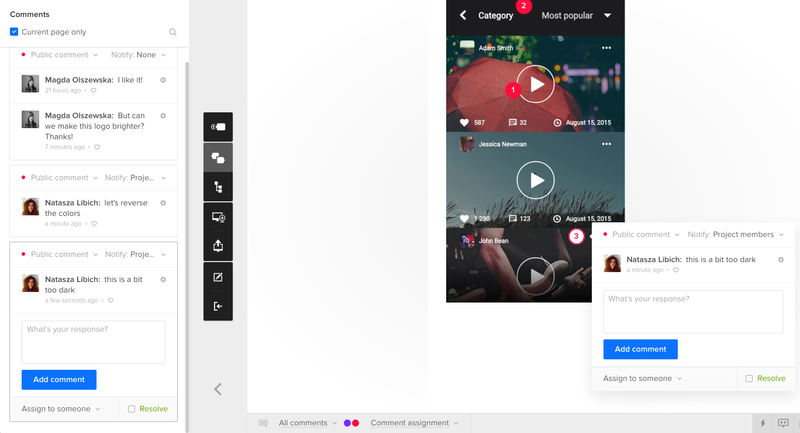 The top margin of the work area is lined with more editing options, a play button that says “Preview”, and a button that lets you “Share” your prototype or wire-frame with your team. When you’re done, click on the “More” button at the top right of the screen and then click on “Log out”. The pluses are many and can be easily gathered from the features section. The tool isn’t very costly either. The tool does have a slight learning curve associated with it. It might take some time for getting used to. A good catch suggested by one of the designers is the lack of an “Offline” mode in the tool. You’d always need to be connected to the Internet to work on UXPin. The tool could benefit from more design options like fonts and customizations. 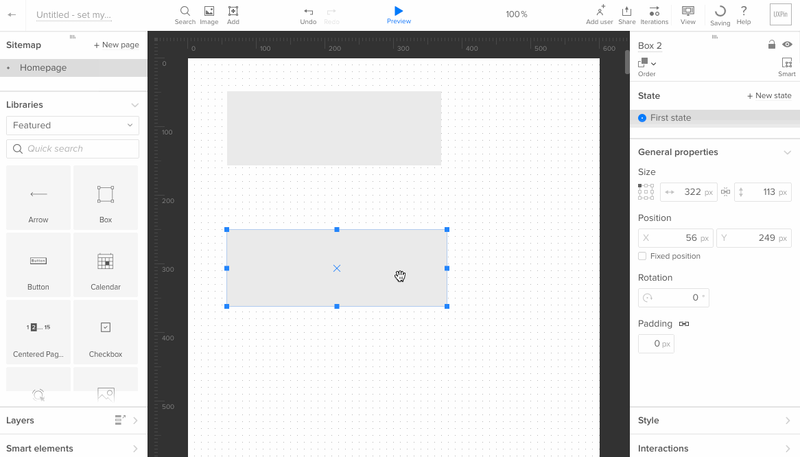 Overall, UXPin is one tool no UX designer should miss. Despite the tiny drawbacks, it is awesomely useful owing to the advanced editor and integrated collaboration features. Posted January 30th, 2017 in Web Design. Tagged: collaboration, prototyping, tool, user experience, ux, wireframing.